For more than 30 years, TGA has promoted the advancement of the glass profession in Texas through advocacy, education, communication, trade shows, and fellowship. Founded in 1948, the National Glass Association, proudly serving the Glass, Window and Door Industries, is the largest trade association representing all facets of the architectural and automotive glass industry in North America. 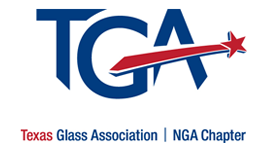 TGA members enjoy many benefits including access to benefits through National Glass Association and Texas Construction Association with their annual dues and the value of membership extends far beyond discounts. Joining TGA you are letting your community and customers know your business is tops in the industry. Regular Membership - any firm or corporation which is a) engaged in the sale, installation, replacement, or repair of glass products, including but not restricted to architectural glass, auto glass, mirrors and leaded glass; or b) conducting business as glazing contractor. A regular member must maintain glass industry equipment products or supplies, have an established commercial location where business is transacted; and be registered where required by law. Associate Membership - any individual firm or corporation engaged in the distribution, manufacturing, and/or fabrication of glass products or involved in an industry business closely allied to the glass product industry and which does not qualify for regular membership. Includes manufacturers representative.